When DB2 gets installed on Z/OS there are several other components that runs in parallel . Like all other Z/OS components, DB2 also runs as a formal subsytem and in different address spaces.Let's see the list of system objects which comprises the core DB2 architecture in z/os. 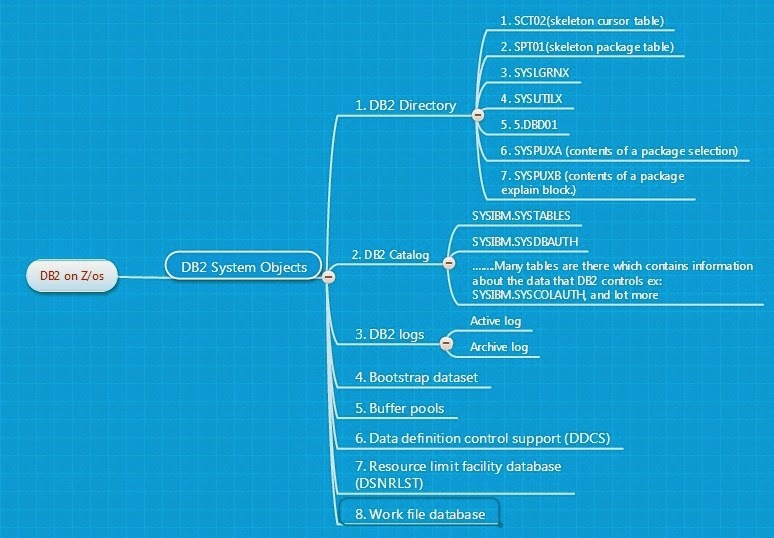 All System objects that DB2 works with in Z/Os architecture. This is one of the DB2 system objects which is being used during normal operation (like to gather information ,etc ) and are totally internal to DB2.We cannot access the Directory tables. 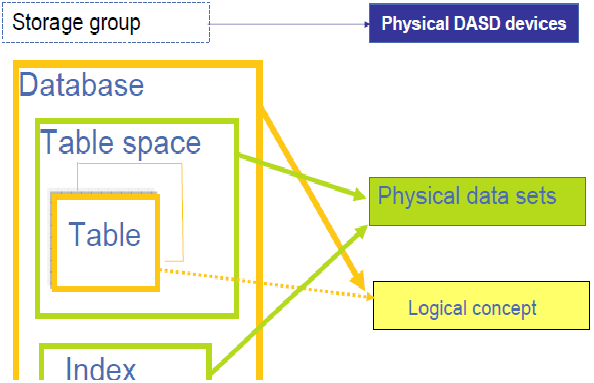 There are system databases like DSNDB01, DSNDB06, DSNDB07 on which all these system objects (as shown above)resides on. SCT02: contains the skeleton cursor table for plans.When we do a DB2 bind for the SQL statements onto a PLAN, a db2 structure is in SCT02 structure.FREE PLAN removes the removes the table structure. SPT01: Similarly when we execute a package Bind, db2 causes a structure to be created in SPT01 Table space..When we issue a FREE PACKAGE command, the SKT is removed from the SPT01. When the utility finishes normally or is terminated, all information about that utility is purged from SYSUTILX. SYSLGRNGX (Logs):Tracks the opening and closing of table spaces, indexes, or partitions. This tracking information is associated with RBA.When a DB2 recovery is requested,the required logs are located and used for quick recovery. DB2 Catalog resides in the DSNDB06 database. DB2 Directory resides in the DSNDB01 database. Work files reside in the DSNDB07 database. When we hear the term catalog,the thing that comes to our mind is 'information being stored/registered' in the z/os system. Exactly the same fact goes for DB2 catalog. How the Catalog and system tables used in DB2? Whenever a DB2 object is created, dropped or altered by any DDL statement or whenever control over the object is changed by any DCL statement of sql, an entry is made in the appropriate catalog table. We can query the CATALOG TABLES to get information, but can not modify these CATALOG tables. Example: When we trigger a SQL query, db2 checks in catalog tables if the table exists or not. Then it will look for SYSCOLUMNS to check if the column exists or not. Further more it checks the SYSTABAUTH to check the authority of the person firing the SQL statement. Similarly when we create a table into one table space, every details about the table, ie the Table name, Table space name, name of the database it is residing on, name of the owner is captured and a new row gets inserted into the corresponding tables. As the name suggests, log is something which keeps track of all the changes done to the database.So every transaction (insert, update, delete) performed on the data is logged in the log files.These information comes useful in crash recoveries. A log file has large number of log records in it.A log sequence number identifies the log record in the log file. DB2 writes each log record on to a file and is known as Active log. Once the space is full, these logs are migrated to tape and becomes Archive Log ( so that they can be referred later when needed). Contains information which are critical to DB2 , such as name of the logs.DB2 uses these information in doing system restarts. We all know about the concept of cache memory.A buffer pool is nothing but cached database page in memory.We can view it as a a virtual storage space for table space or indexes,but this is temporary.When DB2 access the rows of a table,that data page containing that requested row is written to the buffer pool.So next time when the data page is accessed, DB2 eliminates the need to go back to the disk to fetch the row, there by reducing the physical input/output access to the disk.
" For information:::The maximum size of a buffer pool is 1 TB "
Simply these are the work files storage, used by DB2 to process SQL statements. ( like we see SORTWK1...in dfsort /syncsort). The database for the workfiles is DSNDB07. Now lets see brief about user defined Table spaces and other DB2 objects!!! The data structure in db2 consists of Storage group, database, tablespace, tables, index, and index spaces. Among these only the storage group , Table space and index have the physical existence. Rest all are logical concept. Storage group is a physical DASD (direct Access storage device). A table space or an index is associated with one or more of these physical datasets. Table and database have no actual physical representation.We can imagine a database to be big unit which contain tablespace and indexes. The tablespace in turn contains one or multiple table. Since a Tablespace has physical existence ,we need to specify the PRIQTY and SECQTY while creating the table space because they actually allocate primary and secondary space in the DASD devices. What are Object Identifiers(OBID),PSID,DBID in DB2? When we create a object in DB2 database, those objects are assigned with a identifier and stored in DB2 catalog.These object identifiers are called OBID. Going further a table space or index space are assigned with Page Set Id know as PSID. A database is assigned with Database identifier known as DBID. What is a page in Db2: Db2 internally continues read/write operation in terms of equal size units known as pages. How many types of table spaces are there in DB2? Fundamentally the table space is the storage unit for recovery and re-organization purposes; i.e. it is the unit that can be recovered via the recover utility . If the table space is very large , however , recovery and re-organization could take a very long time. 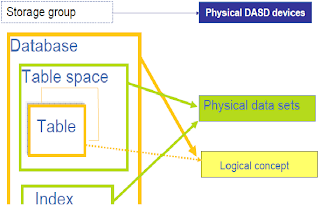 There can be Simple, Segmented, partioned, universal, XML, Large Object Table spaces in DB2. Simple Table Space are obsolete now a day. It can contain rows of one or more tables. When many tables are defined on a simple table space, one single page contains all the rows from the tables.A simple TS can be created by issuing the CREATE TABLESPACE statement without specifying either the SEGSIZE or NUMPARTS clause. Disadvantage of a simple table space is that it unnecessarily locks rows of other tables which are there in that page even when operation is being performed on some other table. CREATE TABLESPACE "REOT001" IN "DBTEST1"
Segmented Table space: Preferred way to build a table space.A table space that is segmented is useful for storing more than one table, especially relatively small tables. The pages hold segments, and each segment holds records from only one table. Segmented table spaces hold a maximum of 64 GB of data and can contain one or more VSAM data sets. The Basic Difference between simple table space and segmented Table spaces is ,segmented table spaces do not support any kind of cross table clustering- that is they do not allow records for different stored tables to be interleaved on a single page. Instead , they keep the tables physically separated. SEGSIZE.Defining small tables in a table space with a large segment size could result in wasted DASD space. Partitioned tablespace: A table space that is partitioned stores a single table. Partitioned table spaces are intended for stored tables that are sufficiently large. A partitioned table space thus contains exactly one stored table, partitioned in accordance with value ranges of a partitioning columns or column combination. Individual partitions of a partitioned table space are independent of each other in the sense that they can be independently recovered or reorganized. They can also be associated with different storage groups i.e. it is possible to store different partitions on different devices and thereby spread the table space I/O load. use of keyword NUMPARTS indicates the partitioned tablespace. index space; instead the index space is created automatically when the corresponding index is created. Like Table spaces ,index spaces can be reorganized and recovered independently. 3.If we apply a column function to one column in a select Statement,we must apply column functions to all the columns specified in the same select statement, unless the GROUP BY clause is used. 4. Result of the column function will have the same data type like the column on which it was applied. 5. Column function will never return a SQLCODE +100. It returns NULL value if the where clause does not fetches any data. But COUNT and COUNT_BIG function returns value, not NULL value. So lets look into the below query which theoretically is doing the same thing, but results will be different. Thus AVG(SALARY) and SUM(SALARY)/ COUNT(*) will be different. The reason being, count function takes all the rows into account, whereas SUM function ignores the rows that has null values. The COUNT function and COUNT_BIG function: The COUNT_BIG function is same as COUNT function except that it returns a decimal value. The MAX and MIN functions: MAX will give the largest value in the expression and MIN will give the smallest one.The Result is of the same data type on which it is applied. SUM function gives the total of values specified in the expression. Scalar functions operate on single value as compared to column function. Below are the Queries along with their output for few scalar functions. Trims the space from the string. Locks are data structures that indicate which part of the system (row, page, table, tablespace, database, ...) is protected in some way. DB2 remembers this information in memory. Blocking the whole database all the time when an application accesses a small part of it doesn't make much sense. So if you have an application that deals with a lot of data, it potentially has to have many locks. Those locks accumulate and need space in memory. So when the list is almost full DB2 does a "lock escalation". That means, many row-level locks held by one transaction on a table are escalated to a single table-level lock, for example. Instead of having 1000s or millions of locks (per row), it is better to have lock on that table , there by relieving the pressure on the lock list. As the number of locks held by any one application reaches near to MAXLOCKS percentage on the create tablespace statement. (If we remeber we use this paramter on table space DDL statement). Database manager will trigger lock escalation and will continue until the percentage of the lock list held is below the value of MAXLOCKS. Lock escalation also occurs if the LOCKLIST runs out of space. The database manager determines which locks to escalate by looking through the lock list for the application and finding the table with the most row locks. Row locks will be replacing with a single table lock. It will keep repeating till MAXLOCKS value is no longer exceeded. Lock escalation can occur for objects defined with LOCKSIZE ANY, PAGE, or ROW. Value ANY just gives DB2 the choice of what lock to take initially. If we use LOCKSIZE ANY, LOCKMAX SYSTEM , it means means it uses the number set by the NUMLKTS DSNZPARM.We can turn off lock escalation by setting LOCKMAX to zero.If we choose this approach, be sure the applications that access the objects are committing frequently, and adjust DSNZPARM NUMLKTS to permit more locks to be taken. Otherwise, we risk hitting negative SQL codes when you reach the maximum number of locks. Lock escalation is thus a way to protect from taking excessive system resources, so if we turn it off, we need to control it. Page lock and Row lock escalate to Table level and then to Tables space level for Segmented tables space. But for partioned tables spaces, the page/row lock escalates straight to the Tables space level. Lock promotion is the action of exchanging one lock on a resource for a more restrictive lock on the same resource, held by the same application process. We can say, it is the process of changing the lock mode or lock size to a more restrictive level. See the below example . Want to refresh about the lock modes and intent lock? check out Locking again. 1. DSNZPARM starts up the parameters for DB2. MAXROWS column of the SYSIBM.SYSTABLESPACE. 4.All the page locks held for data in segmented table space are escalated to table locks. All the page locks held for data in partitioned table space are escalated to table space locks. 5. Why do we get SQLCODE -904 ? NUMLKUS parameter in DSNZPARM defines the threshold for the total number of page locks across all table space that can be held concurrently by a single DB2 application.When any other application tries to attempt lock that cause the application to exceed the NUMLKUS threshold,the application receives SQLCODE -904. We know about the 4 isolation levels in DB2, namely RR,RS,CS,UR. One thing which all these isolation level have in common is Locking. Locks in Databases serves the same purpose as they do in our house or cars.They Decide who can or can not access a resource like Table, Table Space,Rows etc. The DB2 Database manager imposes locks to prohibit "owning" transaction from accessing uncommitted data written by other application, and also to prevent other transactions to make any change to the currently owned rows. 1. SIZE - It indicates the physical size of the portion of data resource that is being locked. Possible sizes are : Table space, Table, Partition, pages. 3. OBJECT - Resources being locked. The only type of explicitly lockable objects are tables. The database manager also imposes locks on other type of resources such as Rows,tables, and Table spaces. 4. DURATION - The length of time a lock is held. LOCK DURATIONS are affected by Isolation level. ex: LOCK acquired by for RR(repeatable Read) transaction is likely to be more than lock acquired by CS transaction. 1.SIZE:The DB2 resources on which lock can be places are as below in ascending order of their sizes. Point to Note: Locks can be taken at any level in the locking hierarchy without taking a lock at the lower level. However, locks cannot be taken at the lower levels without a compatible higher-level lock also being taken. For example, DB2 can take a table space lock without taking any other lock, but DB2 cannot take a page lock without securing TS lock. This happens because one job was trying to acquire a DB2 resource, but that is being locked by other job. IRLM sets a timeout period, after that it terminates the execution and job fails with above mentioned error-code. DBA can provide information about the resource being used and the offending job what is causing the problem.Once that job is complete, we can restart our job from abend step. IS : INTENT SHARE: The Lock owner can read any data in the table if an S lock can be obtained on the target rows or page. IX: INTENT EXCLUSIVE: The lock owner can read or change any data in the table provided an X lock can be obtained on rows or pages to be changed and a U or S lock can be obtained on rows or pages to be read. U: UPDATE: The lock owner can read any data in the table and may UPDATE OR CHANGE data if an X lock on the table is obtained. No page or row locks are obtained. X:EXCLUSIVE: The lock owner can read or update data in the table. Row or Page locks are not obtained. S : SHARE : The Row or Page is being READ by one application and is available for READ-ONLY by other applications. U:UPDATE : Row or page is currently READ by one application and it might get changed by that application itself. U lock will support cursors that are opened with FOR UPDATE OF clause. X: EXCLUSIVE: The Row or PAGE is being changed by application and IS NOT available for other application, except those that permit UNCOMMITTED READ. Indexes are not locked, because their serialization is controlled by latches and concurrency is controlled by data locking. The SKIPPED LOCKED DATA option lets a transaction skip rows that are incompatibly locked by other transactions. This option can help improve the performance of some applications by eliminating lock wait time. You should use this technique only for applications that don't require unavailable or uncommitted data. Transactions using this option will not read or modify data that is unavailable, uncommitted, or held by locks. DELETE statement. You can also use it with the UNLOAD utility. The option works with isolation level CS or RS. It is ignored for isolation levels UR and RR. The next example returns a count of only the rows that are not uncommitted (if no index exists on CUST_NO). Below are the different INSPECT with REPLACE clause and their usage in cobol. 01 VAR-STRING PIC X(20) VALUE 'THIS IS COBOL'. VAR-STRING = "THIS IS COBOL"
INSPECT VAR-STRING TALLYING VAR-COUNG FOR ALL "S" AFTER INITIAL SPACE. VAR-STRING = "MY COBOL PROGRAMMING COURSE"
INSPECT WS-INPUT3 CONVERTING 'PTHASI' TO '3090RI'. because 'P' and 'T' is duplicated. f p'.' to find character that can not be displayed. f p' #' to find blank followed by a numeric character. Open SDSF and give WHO. As a beginner, we are often stuck with the doubt ' Are SYNCSORT and DFSORT same?'. DFSORT IS IBM’S PRODUCT AND SYNCSORT IS PRODUCT OF SYNCSORT COMPANY. The basic functions of both are almost same like SORT,MERGE,COPY and other benefits. ICETOOL is the utility for DFOSRT. SYNCTOOL is in the same way a tool for SYNCSORT. For getting syncsort manual you need to give the licensed CPU serial number. DFOSRT manual is freely available. The easiest way to know if your z/os supports syncsort or dfsort is to look at the messages in sysout for the SORT step. SYSNCORT message begins with WER*. 'E3' is the hexadecimal value for alphabet 'I'. '40' is the hex equivalent for SPACE. So ALTSEQ CODE=E340 will replace 'I' with 'SPACE'. Like wise we can do for any characters provided we know the HEX equivalent of that character. Similarly '4D40' will replace '5' with 'SPACE'. So in OUTPUT we will see 'I' and '5' getting replaced by SPACE. REMOVECC omits the ANSI carriage control character from all of the report records. NODETAIL generates a report with no data records. SYNCSORT TO EXTRACT A RECORD USING SUB STRING CONDITION. SS looks for the sub string 'IS' in the position 1 to 20 in the input file and puts that reocrd in the output. EXPLANATION:The above JCL will filter out the unmatched record from INPUT2 by comparing with INPUT3. To find out the matching record we need to use. To Write more than one Trailer we need to use the keywords "Trailer1,Trailer2,Trailer3." we will see how to write trailer for count of records and total of records. Explanation of the keywords used: TRAILER1,TRAILER2,TRAILER3,COUNT,TOT are the keywords for SORT cards.OUTFIL is used to print the reports.REMOVECC in sort is used to remove the Cariage control inserted by DFSORT in first position. The value of '1' in the first position of a record tells the printer to start a new page.To remove these carriage control, we need to use REMOVECC in OUTFIL statement. TOT=(10,6,ZD) will make the total on 6 digits starting in 10th column. If we use NODETAIL,then we would see only the trailer and header records.Other records would not be shown in output. Omitting NODETAIL in OUTFIL would ensure we see all records along with trailer and header. DFSORT TO COMPARE THE HEXCODE/ASCII OF CHARACTER ALPHABETS. Explanation: The above sort card checks for the characters from A to O. All other characters will be eliminated. '41' hex of 'A' and '4F' is hex of 'O' in ASCII. DFSORT TO INSERT/ADD DELIMITER/CHARACTERS AFTER EVERY RECORD. Explanation:MID=C'`' tells DFSORT to insert the character between the fields. SQZ operator in DFSORT/SYNCSORT can be used to remove spaces between characters. We can use SQZ operator to remove the spaces and format the field. Explanation: We are squeezing out the blanks and shifting the characters to the left for all the data in thje positions 1 to 40.